This is a holiday with a difference and not for the faint hearted as the emphasis is definitely on the fasting. However, although not easy, once you are on their fasting programme it is not as difficult as you might think… guests are allowed herbal teas, water and the seasonal juices taken from the fruits of the land – along with a very weak broth which is served as the evening meal. Fasting is phased in and out, so ‘meals’ are given four times a day – which means that you never actually get hungry. The programme can run from 10 days to two weeks in which time you are encouraged to take part in their excellent daily yoga sessions as well as a number of other treatments. Guests are also required to take a carefully selected formula of nutritional supplements as well as Bentonite to aid in the detoxification process. With a main house for the staff and dining area, there are smaller cottages and chalets dotted around the site for the guests. Rooms are basic but clean; however this will not be an issue as during your stay you will find yourself spending most of your time outside in the grounds or at the beach. At Moinhos Velhos it really is the people who make this place, not just the staff, but the guests too (who are unavoidable due to the set communal meal times). Visitors come from all over the world and from all walks of life from midwives to housewives, lawyers to engineers – but mostly women who have come to de-stress, cleanse, lose a few pounds or just get out of their usual surroundings and leave their desks and homes behind. If you are not the sociable type, you may surprise yourself as it is amazing what a lack of food can do to bring people together, talks of faecal changes and weight loss are frequent as well as conversations about past and future meals to be had! 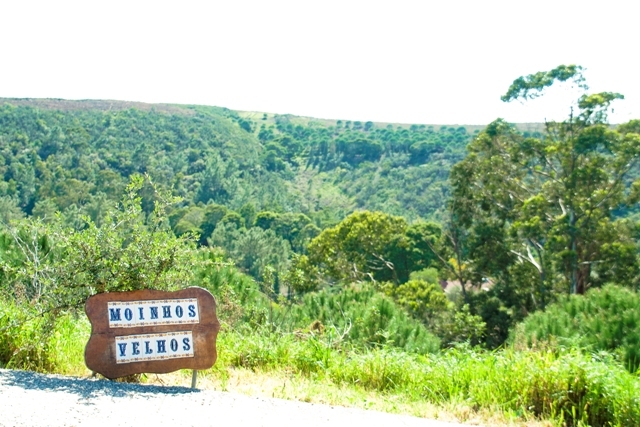 The founders of Moinhos Velhos say that fasting is for the mind, body and spirit. At the very least, by the time you leave this retreat you will feel as if you have unloaded the toxins and stresses of daily life – don’t be surprised if you have shed a few pounds too. Cottages are placed in rows and some cottages have adjoining rooms – ideal if you need a carer close by, but would prefer not to stay in the same room. The yoga and meditation sessions take place in the ‘temple’, a glass building with excellent light and little clutter. The sessions themselves are run by trainers who take the time to explain and guide those that need extra support. With a maximum number of around 12-14 participants this will never be an overcrowded retreat. There is a distinct lack of signage at the retreat. In fact, the only sign to be found was a slightly wonky Moinhos Velhos poking out of the ground at the entrance. There will be no signal for your mobile phone due to the location of the retreat; however there is a phone in your room which you can use to contact the staff. If you have no sight at all, navigating your way from the main house to your cottage may prove tricky, as there is a steep path which is almost impossible to walk down in heavy rain. A sighted guide is highly recommended for this trip as the staff are not always easy to find and amenities are limited. The rooms were poorly lit and the heating was not always working, however the staff were happy to step in when needed.